Australian writer HELEN STUBBS loves the beautiful weird, especially fiction about the future and alternate realities. Her short story The Perforation won the Aussiecon Four Short Story Competition and her unpublished novel Black Earth was a quarterfinalist in the Amazon Breakthrough Award. Her short stories appear anthologies and magazines including Winds of Change and Midnight Echo 6. Her interests include chatting to strangers, fretting about the environment and marvelling over art and innovation. Contact Helen at twitter.com/#!/superleni and helenstubbs.wordpress.com. You describe your writing as having an “eco feminist” slant. Can you tell us a bit about what that means? How important do you think it is for speculative fiction to tackle the big issues? I mean stories that take civilisation’s trajectory to its logical extreme, or explore our place within our ecology (and universe), and the interconnected lifecycles there. My favourite eco feminist author is Sheri Tepper, who explores the future of humankind out in the universe in books like “The Companions.” I’ve always found ecological relationships and lifecycles fascinating. As for big issues, a fiction writer’s first priority must be to entertain their reader (or you won’t have readers). There are many examples of great Spec Fic that don’t explore big issues, however, when I begin to wonder about the universe it leads me to big questions. I love fiction where humankind gets a cosmic spanking for its arrogance, like when extra terrestrials come down and beat us up because we have technology but no conscience about how we use it. Your novel, “Black Earth”, was a quarter finalist in the Amazon Breakthrough Award and was read by Angry Robot. While it wasn’t picked up, this must have given you a great deal of confidence in the level of your writing. How did this recognition impact your writing? Has it created any other opportunities you might not have otherwise got? These were encouraging…but, confidence…not really. When my work is chosen for something I want to shake the editors or judges and say, “Are you sure?” Parts of Black Earth are positively cringe-worthy. I find the more I learn about writing the more I realise I don’t know, while it seems like there is some magic in great writing that possibly can’t be learned. Still, I’ll keep sending my work out put my hand up for anything because I love writing, working with editors, and talking with writers. And if I waited until my writing was perfect I’d die first. Are you likely to return to “Black Earth”, or are there other projects you will be working on in the near future? I plan to submit “Black Earth” to the Vogel’s Literary award, as it isn’t doing anything else… and I’m just young enough. I’m currently working on a novella, “The Cupcake Girl of Winding Street,” with which I’d like to test the waters of e-publishing. I’m also writing a Science Fiction novel about a half robot girl who cares for a herd of humans, post I.T. takeover. I loved “Debris” by Jo Anderton and “The Couriers New Bicycle” by Kim Westwood. I also loved “Valley of Grace” by Marion Halligan, which is not Speculative Fiction. Aussiecon 4 was my introduction to the scene so I’m not sure what it was like before, but since then I’ve found the community very friendly and highly talented. I had the best time at Aussiecon 4! Somehow I’d won their short story comp so I got to go in the green room with the real writers. A huge convention like that grabs attention, inspires people and forges more connections between the community hotspots of Australian Spec Fic. It also creates international opportunities by bringing foreign publishers and agents in. This entry was posted in Writing and tagged 2012snapshot, Helen Stubbs, interviews on June 4, 2012 by David. Great to hear what you’re working on now, Helen. And ‘Hello!’ Angela. My worlds are having a little collide here. 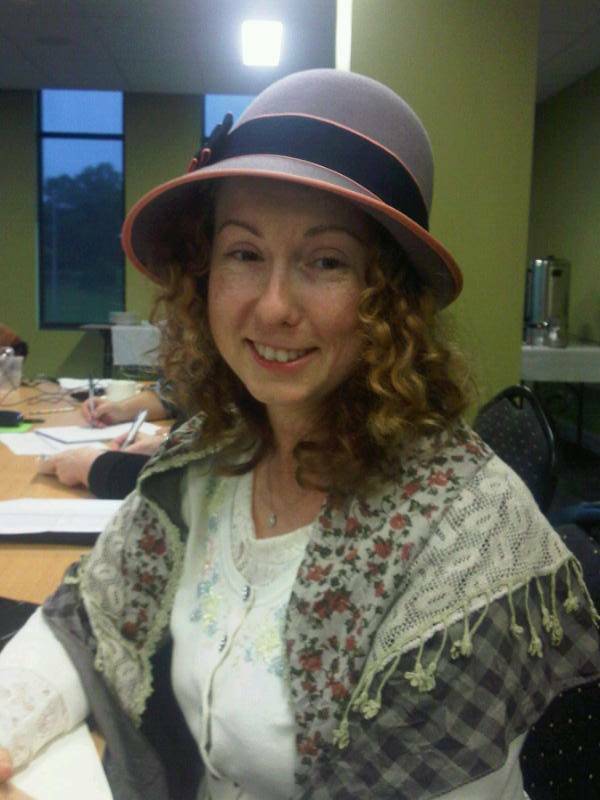 Angela Sunde is a lovely Children’s author and illustrator, and a friend, from the Gold Coast. Her book, ‘Pond Magic,’ does have a touch of the Speculative in it, I believe, as her main character, Lily, begins to turn green. Wonderful snapshot inside the mind of Black Earth Helen. Thanks for the post, David, and thanks for sharing, H. It’s a very exciting journey, isn’t it?